Submitted photo Den Leader James Denton and Carson Hill, Webelos Cub Scout are pictured with Gene McKinly, Cub Master Pack 263 Beavercreek. BEAVERCREEK — Beavercreek Cub Scout Carson Hill from Pack 263 was named Cub Scout of the Year. Hill was awarded the title of Cub Scout of the Year for the Chillicothe District of the Tecumseh Council, Boy Scouts of America. The Chillicothe District consists of the communities of Greene County, including Beavercreek, Bellbrook, Cedarville, Fairborn, Jamestown, Spring Valley, Xenia, Yellow Springs and Wilberforce. Hill was presented his award during a ceremony held at the district roundtable meeting on Jan. 10 at the Greene County Career Center. The Boy Scouts of America organization looks for certain attributes when deeming a Cub Scout with such recognition. Some of those attributes include demonstrating genuine interest in the organization by showing high levels of engagement and participation, consistently displaying their proper uniform and acceptable appearance, outgoing personality, shows respect and demonstrates scout laws during and outside scouting events. The nominations are chosen and submitted by the den leaders and Cubmasters of each Pack. As a Bear Scout, which is the program Hill was involved, he completed all 13 elective adventures, in addition to the six required adventures for rank. “Carson also earned the Cub Scout Outdoor Activity Award and the Dr. Luis W. Alvarez Supernova Award, which recognizes superior achievement by the Cub Scout in the fields of science, technology, engineering, and mathematics,” Denton added. Hill was recognized at the district level during a special ceremony. He competed against numerous other local scouts, only learning of his win during the event. Hill was presented with an plaque as well as a custom name tag to be worn on his Scout uniform. 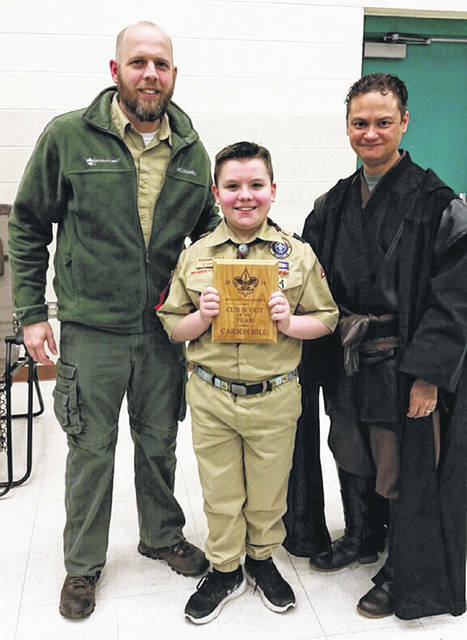 https://www.beavercreeknewscurrent.com/wp-content/uploads/sites/49/2019/01/web1_ScoutAward.jpgSubmitted photo Den Leader James Denton and Carson Hill, Webelos Cub Scout are pictured with Gene McKinly, Cub Master Pack 263 Beavercreek.